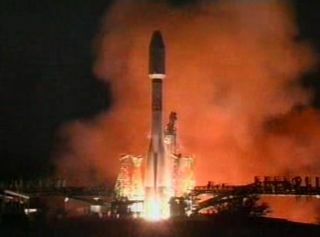 A Soyuz 2 roket carrying the European MetOp-A weather satellite launches into space from Baikonur Cosmodrome in Kazakhstan on Oct. 19, 2006. MetOp-Apolar-orbiting weather satellite successfully reached orbit Thursday, ending afour-month series of satellite- and rocket-related delays and opening a newchapter in U.S.-European cooperation in space-based meteorology. The satellitelaunched atop a newly designed Soyuz 2-1a vehicle at 12:28 p.m. EDT (1628 GMT)from the Baikonur Cosmodrome in Kazakhstan [image],and was reported in good health immediately after its separation from thevehicle. "It was very intensive," said MetOp flight director Andreas Rudolph in post-launchbroadcast from the European Space Agency's Space Operations Centre inDarmstadt, Germany. "I feel very relaxed of course because we now can see thatwe have a mission." Today'ssuccessful liftoff marked the thirdtime in as many days that launch officials readiedMetOp-A and its Soyuz 2booster for flight [image].Three previous launch attempts in July were also plagued by delays. The4,085-kilogram MetOp-A [image],carrying 11 observing instruments provided by European and U.S. governmentagencies, will become part of a jointly operated system including U.S. andEuropean satellites. Built by a40-company team led by Astrium, MetOpwill be operated by Europe's EUMETSAT meteorological organization, based inDarmstadt, Germany. Threeidentical MetOp satellites are being built as part ofa 15-yearprogram to provide continuous coverage of what is known as the mid-morningpolar orbit. MetOp will be crossing the equator atthat time of day. U.S. satellites provided by the National Oceanic andAtmospheric Administration and the U.S. Department of Defense will be providingsatellites for the early morning and afternoon polar orbits. The three MetOp satellites will belaunched at four-year intervals to assure uninterrupted coverage. SPACE.comStaff Writer Tariq Malik contributed to this report from New York City.